Ian Graham’s book, Scarlet Women, tells the stories of the most notorious courtesans, concubines and royal mistresses. The hetaerae of Ancient Greece, the Cortigiani Onesti of sixteenth century Venice, the Oiran of Edo-Period Japan and the demimondaines of nineteenth century France were the premier division of courtesans and mistresses their time. Their liaisons with royalty, aristocrats and statesmen brought them wealth, freedom and influence undreamt of by most women. They preyed on kings and emperors trapped in loveless dynastic marriages. However, few of them enjoyed the fruits of their labour in old age. Disease, gaming tables and executioners often robbed them of a happy retirement. They lived outrageous lives in the fast lane. Lola Montez triggered a revolution that unseated a king. Liane de Pougy ran away to become a courtesan after her husband shot her. Veronica Franco, the most famous Venetian courtesan, was accused of witchcraft by the Inquisition. A concubine called Cixi rose from obscurity to rule Imperial China for nearly half a century. Anne Boleyn was one of very few royal mistresses who married her king and became a queen ... until he executed her. Jane Digby was probably the only admiral’s daughter to romance a king and marry a Bedouin Sheikh. Harriette Wilson blackmailed 200 of her lovers. Cora Pearl is said to have served herself naked on a silver platter to guests at one of her legendary parties. Marie Duplessis made such an impact in her short life that she inspired characters in Dumas’ La Dame aux Camélias and Verdi’s La Traviata. When the last of the great courtesans of the demimonde, a volcanic beauty known as La Belle Otero, was found dead in a French hotel room in 1965, a rare species slipped into extinction. 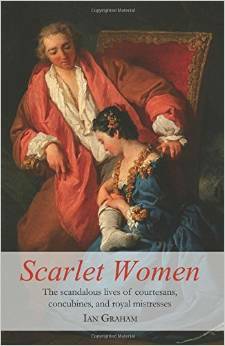 "These scarlet women had me blushing from the first page." "Graham demonstrates in delightful detail that no one understood better how to "lean in" than the world's great courtesans." "Comprehensive and fascinating, Ian Graham’s Scarlet Women offers an intimate look at a bygone world where courtesans and demimondaines used charm and wit to rule from behind the scenes—and from their beds. A fun read." 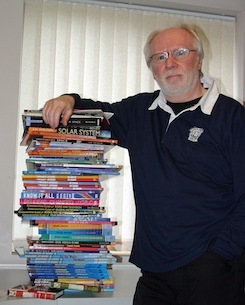 Ian Graham has written an interesting piece for the Eastern Daily Press. Ian Graham’s Scarlet Women was a selection for Metro magazine’s feature on ‘Books for your feminist book club’.